Fancy a road trip in gorgeous Slovenia? So did I! Slovenia has been on my bucket list for years. I’ve heard many tales of its beauty from other travelers, but I hadn’t a chance to visit myself. After some planning I recently finally got to see the country I’ve been daydreaming of for so long with my own eyes. Together with my parents and boyfriend we drove all the way from Transylvania in Romania to “The Sunny Side of the Alps” and spend 10 amazing days road tripping through Slovenia. With an area of over 20K km2 and a population of over just 2 million, Slovenia is pretty small. Seriously, have a look at a map. It’s tiny. You can actually get from one side to the other in less than 3 hours by car on the highway. Even if you don’t like fast driving, the alternate smaller main roads and rural roads are also kept in excellent condition and will lead you to your destination in pretty much no-time. 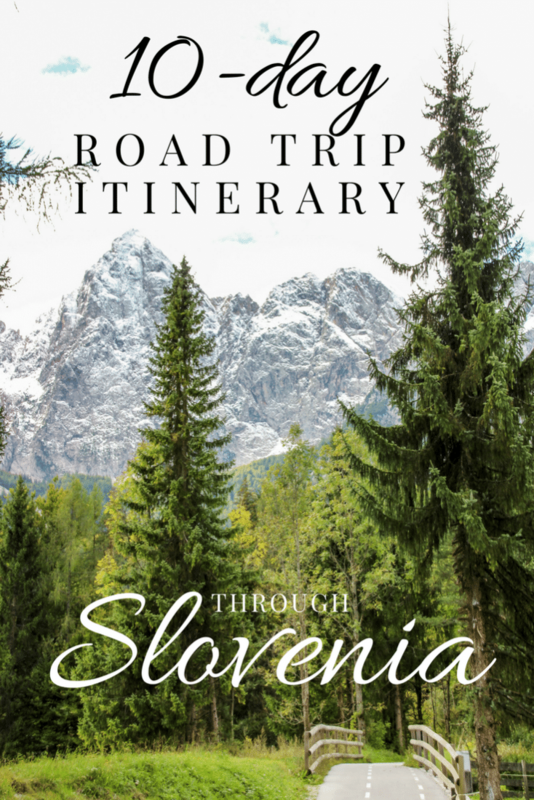 Wanting to see as much of the country as possible and having under two weeks to do it we concluded that a road trip was our best option to explore Slovenia thoroughly . For car rental options in Slovenia click here. Here’s how you can make the most of a 10-day road trip through beautiful Slovenia. Start your visit off in colorful Ljubljana and get a taste of Slovene life firsthand in the capital. Stay for one day, or better yet stay for three, as we did. Wander around the charming streets of the Old Town and visit the iconic Triple Bridge, see the grandiose Cathedral or check out Town Hall. 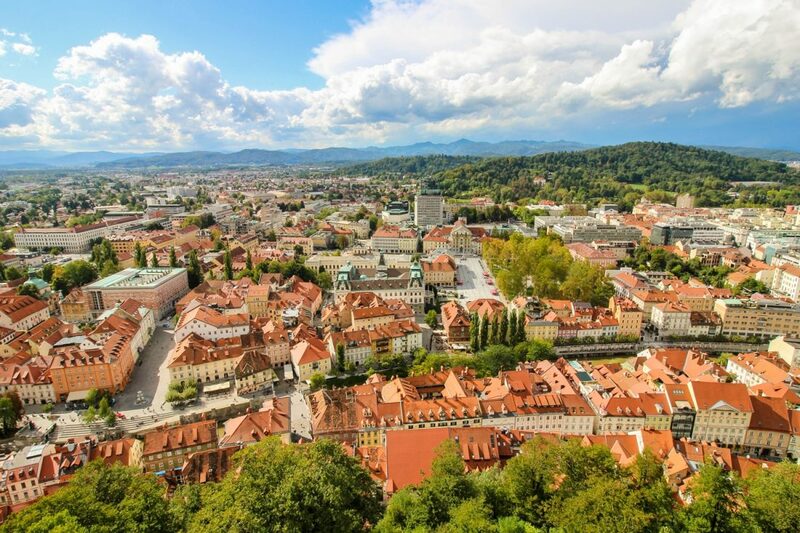 For the best views of the Old Town head up to Ljubljana Fortress and enjoy a 360-degree panorama of the capital from the tower. In case of a rainy day you can choose between the numerous museums the city has to offer, like the Natural History Museum, the Museum of Illusions, or the science-themed House of Experiments. 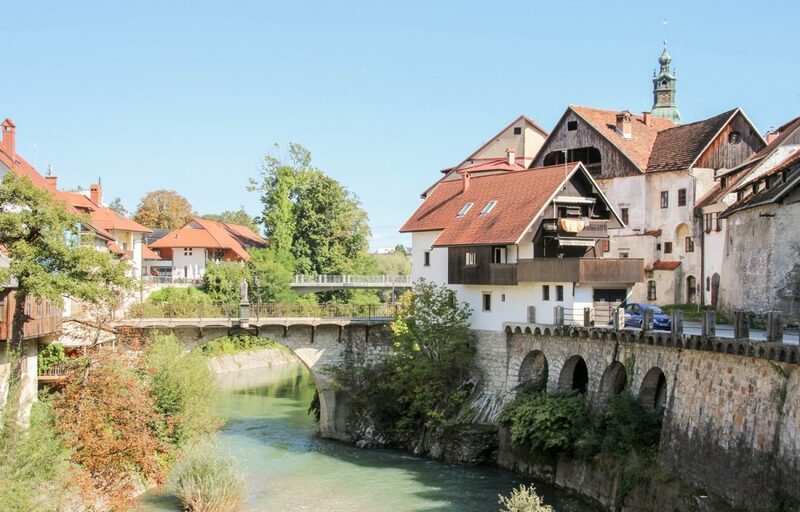 If you’re not in the mood for sightseeing, just sit and sip on a cup of coffee in one of the many cafes located by the banks of the Ljubljanica River. If you want to save some money while staying in Slovenia’s capital, consider booking your night at a hostel. Check our guide to the best hostels in Ljubljana for some fantastic hostel options. Prolong your city sightseeing days by heading to Maribor, the 2nd largest city of Slovenia, located 90 minute drive away from the capital. Maribor boasts plenty of historical sites, such as remains of the 13th century old city walls, the Gothic-style Cathedral, Maribor Castle and Town Hall built in typical Renaissance style. But the city is most famous for its fine wine, so don’t hesitate to enjoy some local treats while you’re there. 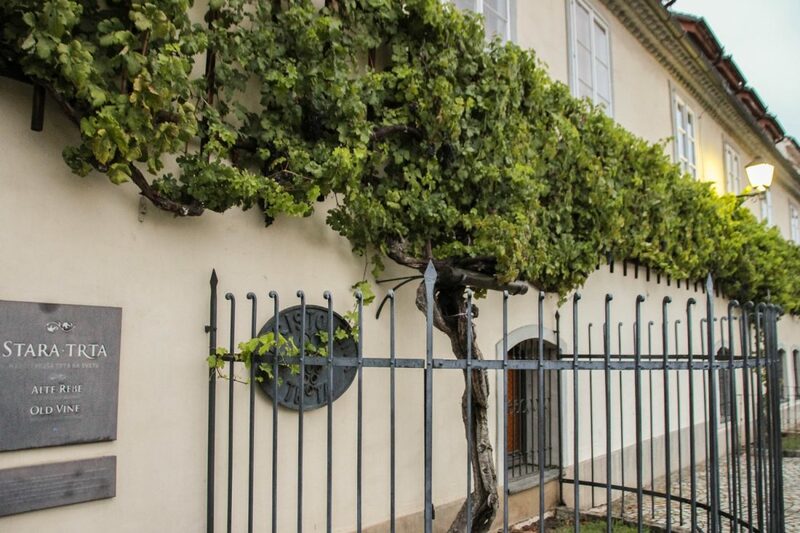 And make sure you visit the 400 year-old grape vine growing just outside the Old Vine House on the riverbank. Insider tip: parking is free in the city in weekends! 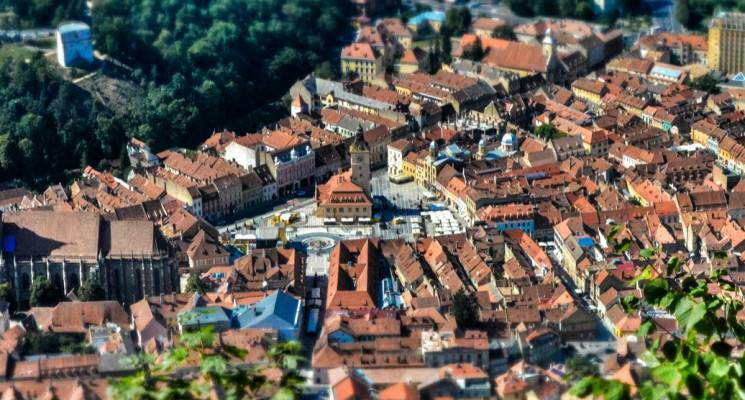 For accommodation options, independent reviews, and rates in Maribor click here. If you’ve had enough of cities, plan a visit to the natural attractions Slovenia is so famous for, namely its caves. First drive down to Skocjan Cave and get prepared to feel like a tiny, insignificant little human next to the powerful forces of nature. Throughout the 1.5 hour-long guided walking tour you’ll learn to look at cave systems in a whole new light and you’ll probably never underestimate a river again in your entire lifetime. 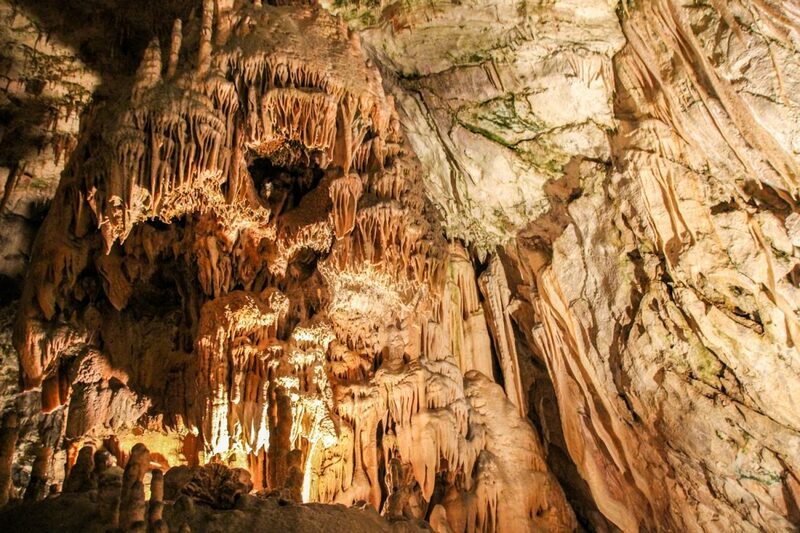 For your second exploration head over to Postojna Cave, one of the most visited caves in the world. You’ll be taken by a small train to the heart of the cave where you can admire the most spectacular stalagmites and stalagtites during a 45-minute walking tour. Afterwards you’ll once again enjoy the perks of a 20-minute train ride from the center of the cave towards its exit. What better way to conclude such a cave-themed day than by visiting Predjama Castle? The Renaissance building was actually built inside a cave’s mouth and is located merely 15 minutes away from Postojna, so make sure you include it in your itinerary. 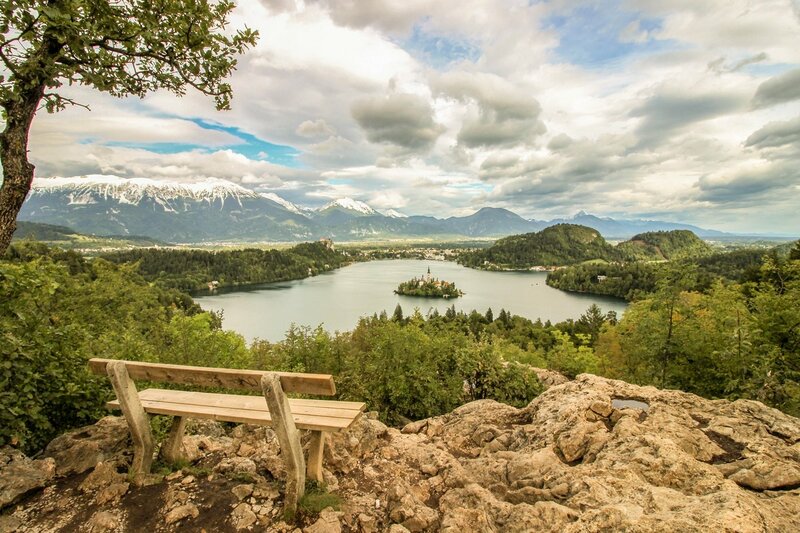 It’s time to leave Central Slovenia behind and head over to Upper Carniola, where you can visit the famous Lake Bled and much more. If you don’t like crowded places, I’d suggest you pick an accommodation site in charming Bohinjska Bistrica instead the city of Bled. Once you’ve settled in and still feel like there’s a bit of adventure inside you, I’d recommend hiking through the Vintgar Gorge. For an entrance fee of just 4 euros you can trek for 2 hours on the education trail made up of wooden bridges and pathways. At the end of the trail you’ll be greeted by the 13-meter tall Šum waterfall, the tallest river waterfall in all of Slovenia. By this point into the trip you must be pretty tired. Regain your forces in the afternoon and pamper yourself at the local spa in Bohinjska Bistrica. Bohinj is a more underrated lake compared to Bled, but in my mind that’s the beauty of it. 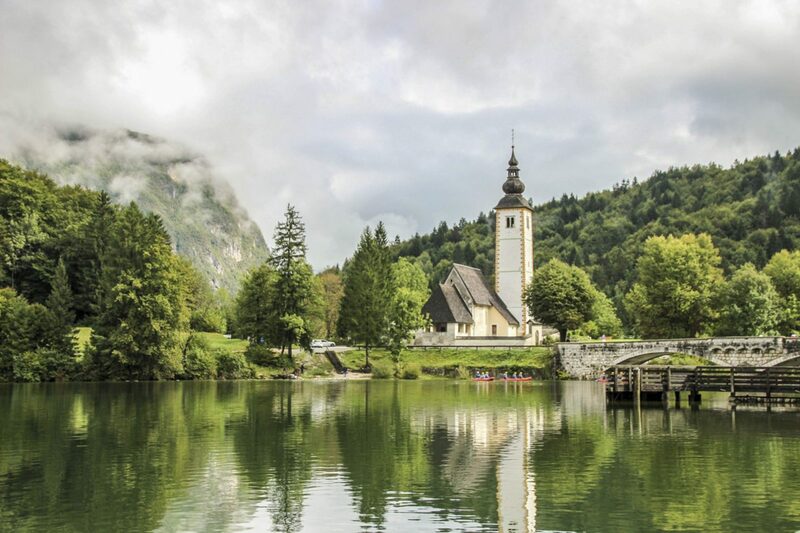 Lake Bohinj is not so crowded and might even boast a more scenic backdrop than Lake Bled, since it’s nestled deeper into Triglav National Park. Have a nice picnic with your significant other by the lake or opt for a day of canoeing/kayaking if the weather’s good. 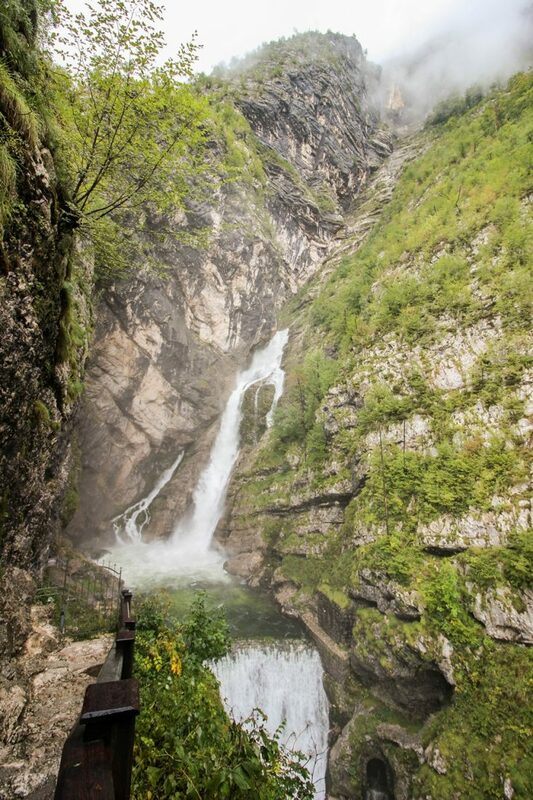 If you’re eager to explore more of this area, head west to see Savica Waterfall, the main source of Lake Bohinj. 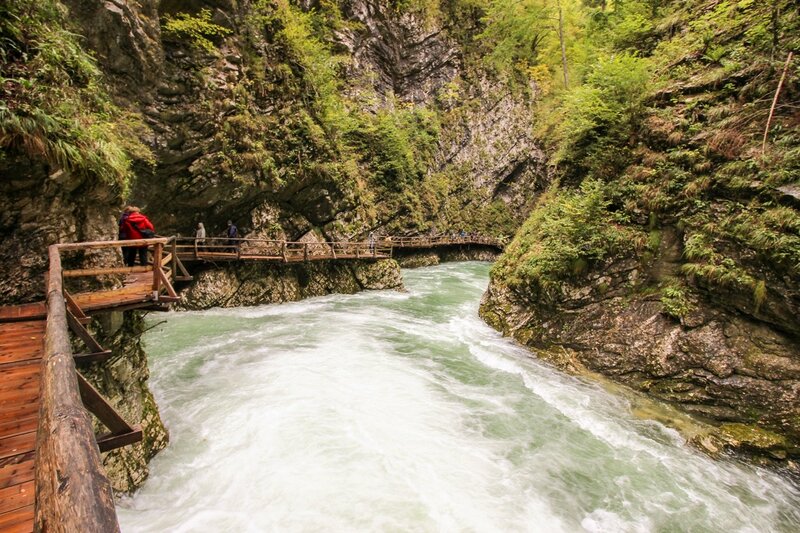 The waters of Savica have a 78 meter drop and can be reached through a short 25-minute hike on a well-marked trail. The entrance to the park will set you back 3 euros. You can also enjoy an unparalleled view of Lake Bohinj by ascending to the nearest ski center called Vogel by cable car. The ride costs 15 euros round-trip and in a couple of minutes you’ll not only get to see the magnificent lake from above, you’ll also be a lot closer to quite a few hiking trails offering promising views of the National Park. 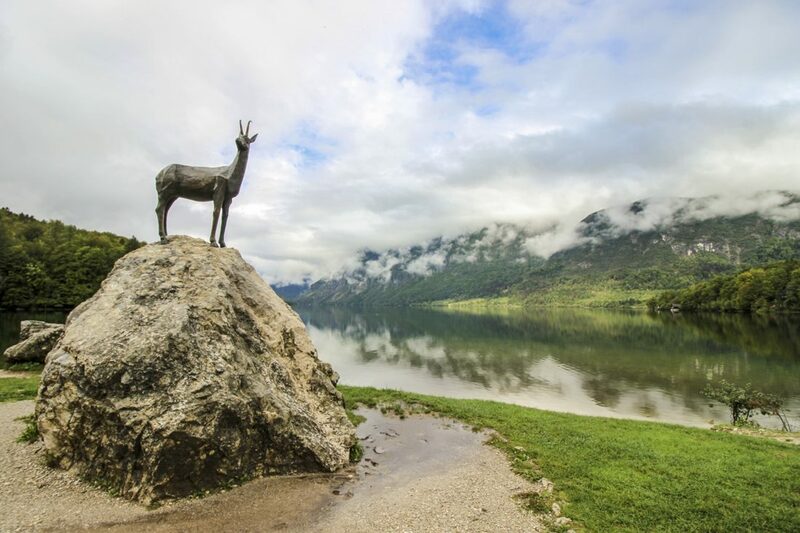 For accommodation options, independent reviews, and rates in Bohinj click here. 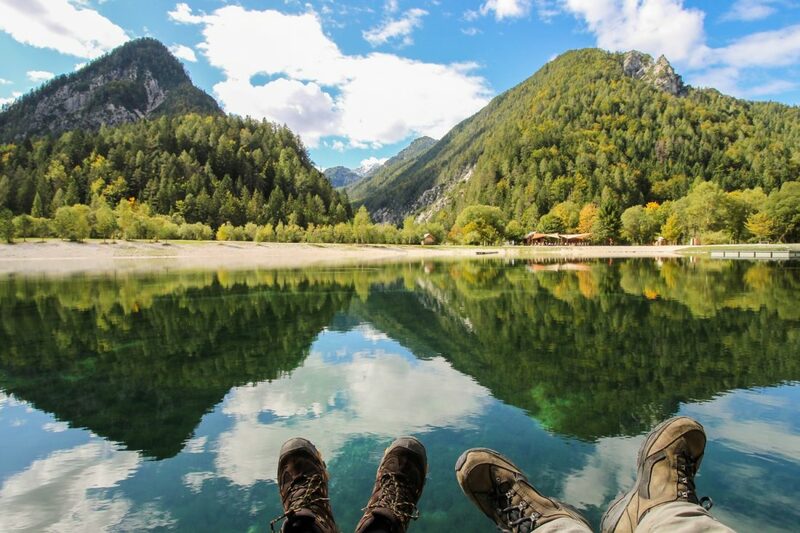 Head North to see a different angle of the mighty Triglav National Park. Right before you get to the triple border, between the last two villages in Slovenia (Ratece and Podkoren) you’ll find one of the most scenic hidden gems in the entire country, Zelenci Nature Park. The park is actually a wetland reserve with unique wildlife, plants, and the confluence of the Sava River. This picturesque piece of natural beauty is absolutely worth a stop along your road trip in Slovenia. The charming town of Kranjska Gora is not only a beloved alpine resort, but also the gateway to Vršič Pass, the highest mountain pass in all of Slovenia. Since the weather conditions were bad at higher altitudes, we didn’t manage to get through the pass this time, so we only visited Lake Jasna, made up of two connected artificial lakes located at the start of the Vršič road. For accommodation options, independent reviews, and rates in Kranjska Gora click here. Lake Bled is one of the most-visited places in Slovenia, thus it can get quite crowded at times. If you’d like to get a traditional view of the lake, head up to the castle and explore a little bit of its history while also enjoying the view. If you’d like to avoid the crowds then the Ojstrica viewpoint is the one for you. Even though it requires more effort than getting to the castle, the hike is easy, there are much less people and the view is even better, with the mountains and the castle serving as the lake’s backdrop. For accommodation options, independent reviews, and rates near Lake Bled click here. After so many days of exploring the country’s northwestern part, it’s time to head to southeast Slovenia to see some underrated places. As you head over to your next accommodation site, make a few stops along the way in some lesser-known small towns with quite impressive stories. In Kropa you’ll find not only a cute village, but also a thematic Iron Forging Museum where you can learn all about the region’s lengthy history of iron-working. Radovljica boasts colorful Renaissance houses in its small center, along with a fascinating Apiculture Museum, focusing on the long tradition of Slovenian beekeeping and honey making. Skofja Loka is worth the stop for its picturesque old town, impressive history museums and narrow streets. As a base for your southeast Slovenia exploration you can choose either the big city of Novo Mesto or a smaller town like Dolenjske Toplice, which also features a few thermal baths. Travel back in time by visiting the remains of the 17th century fortress in Soteska, currently abandoned and covered in wild vine. If you’re curious about a more intact architectural site, then the well-maintained Žužemberk fortress should definitely be on your list. 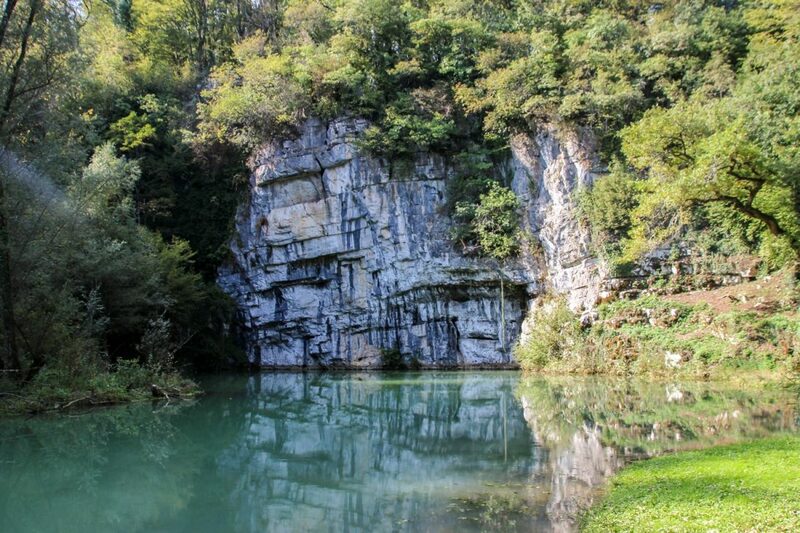 End the day with a unique natural attraction and travel south to the karst spring of the mighty Krupa River, which has its fair share of mystical vibes. 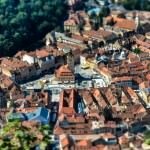 For accommodation options, independent reviews, and rates in Novo Mesto or Dolenjske Toplice click here. On your final day of your Slovenia road trip, you might want to squeeze in a morning of pampering at the local wellness center before you hit the road. 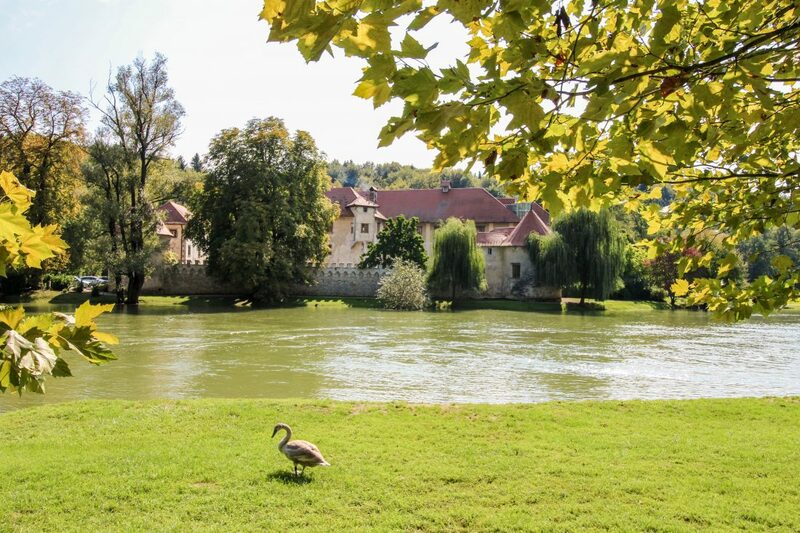 If you can, take a detour to visit Otočec Castle, the 13th century fortress which is perfectly-preserved today and currently functions as a hotel. Don’t forget to take a small souvenir with you before you leave (I recommend some fine Slovenian honey if you fancy it). The best time to visit Slovenia (if you want to avoid the crowds and still enjoy some nice weather) is in the months of May and September. Naturally, if you want to spend time at the seaside, the summer months are better for a visit, however you’ll need to take into account that the resorts are small and can get jam-packed with tourists in July and August. In order to save a few bucks on your road trip, consider eating at local bakeries. You’ll find them everywhere near the city centers and even in small villages, boasting the signpost “Pekarna”. They have a wide variety of fresh pastries, huge pizzas and tasty dairy products which you can take with yourself anywhere you go and eat it in the most scenic places in Slovenia. Don’t forget to pay the road toll as you enter the country to avoid getting a fine. If you’re in the country for a shorter period you can purchase a 7-day pass for 15 euros, otherwise pay the 30 euro tax for the entire month. To summarize, I definitely recommend exploring Slovenia by car. It saves you a ton of time, gives you a lot of freedom and also the possibility to explore big distances leisurely. Save some money by staying in local guesthouses instead of hotels and eating at bakeries instead of restaurants. 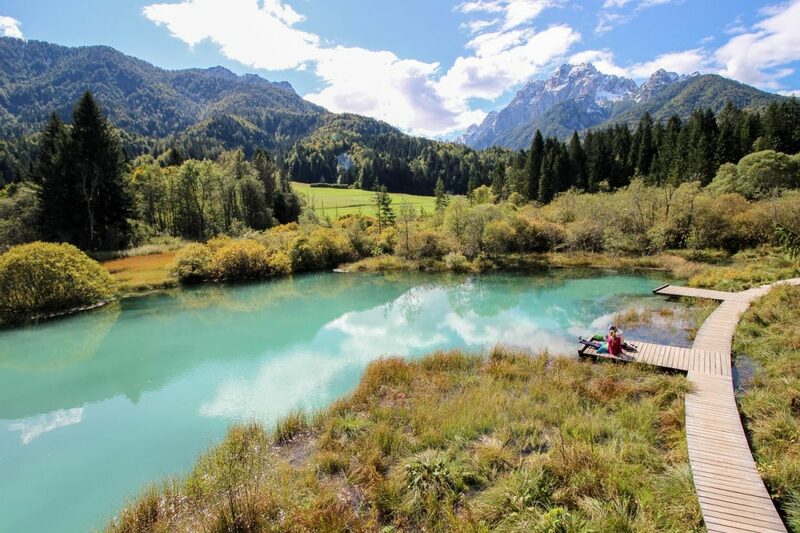 Enjoy the best of what the country has to offer, but don’t hesitate to look beyond the popular sights and visit some lesser-known destinations as well to discover the authentic side of Slovenia. Also, if you need any additional help in organizing your 10-day road trip itinerary through Slovenia, feel free to ask! 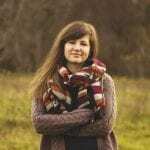 Adrienn Takacs is a Hungarian freelance travel writer and blogger at CityoftheWeek, based in the heart of Transylvania, Romania. She hates the Dracula stereotype her country is so famous for and aims to promote the beauty and diversity of Romania whenever she can. During her travels she loves to go hiking, snorkeling, wandering around narrow, cobbled streets and exploring underrated destinations. Disclaimer – We have included a few handy little affiliate links in case any of our readers want to book accommodations or car rentals. We receive a small commission for any sales made, without any additional cost to you, our dear reader. Adrienn, Thank you very much for your interesting blog about your stay in Slovenia. I think you have done a great job. Of course, as a local guide, I would add some off the beaten track stops and would share some little hints, however the most important is, that visitors come and discover it by themselves! Thank you very much! Dear Adrienn, thank you for this wonderful information. We are from South Africa and will be visiting Slovenia, Croatia, Hungary and Romania in April/ May . We have one month. Romania is only a 3 day visit from Budapest to Oradea as my niece and her husband work there for a 3 year contract as engineers. This is my question. Should I other rather visit Romania as a next visit to see the country? This will be time consuming from Budapest by train, and I Romania seems like a very nice country to visit for a two week period itself. I will absolutely use your Slovenia information, thanks a lot! First of all, thank you so much for your kind words! I think you’ll love your one-month trip, since this part of Europe has so many amazing things to offer. Oradea is a beautiful city and there are plenty to do in the surrounding areas as well, especially in the nearby Apuseni Mountains. Although 3 days is nice for a teaser of Romania, I’d recommend planning a two-week trip to get a real taste of the country. 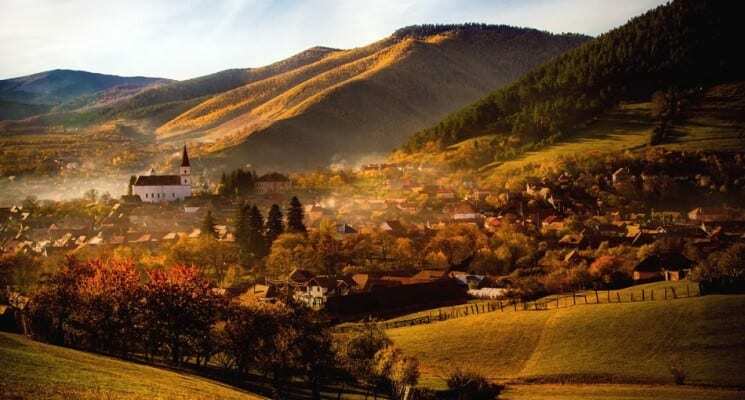 You might want to look into some of the most famous gems of Transylvania (Brasov, Sibiu, Sighisoara, Cluj-Napoca, Bran Castle, Peles Castle, Bucegi Mountains, Biertan, Viscri, Turda Salt Mine, Nera Valley), along with the city of Iasi, the painted monasteries of Moldavia, the beautiful Bucovina region, the capital city of Bucharest and the mandatory Danube Delta. If you need any further information or have any questions at all, don’t hesitate to reach out to me via email. Thanks for writing this. So much Slovenia travel blog posts just rehash the same basics over and over. It was nice to read something with some details and off the beaten path suggestions. We are going to Slovenia for two weeks in September. Most folks sasy that they wish they had more time to spend in Slovenia and even with two weeks there are things that just won’t fit (We travel with kids so we move at a slower pace). Thank you for your kind comment 🙂 We tried to squeeze in some lesser-known destinations, but even so our time was so limited with (less than) 10 days. Slovenia is a country which offers so many wonderful attractions that it might take years to discover them all. Even so, I was really happy we got to experience a small taste of it and it’s surely a country I will be returning to in the future. As always, your articles to my future travel destination is very helpful. Any suggestions on mid range hotel in Ljubljana and Lake Bled?